The Trade and Assistance Review 2016-17 was released on 26 April 2018. The review contains the Commission's latest quantitative estimates of Australian Government assistance to industry. This year's review also explores how Australia should best respond to the USA using its leverage to protect their domestic industries. Global trade policy appears to be at dangerous cross roads. The US, having long led the drive to liberal world trade with positive effects on growth for almost all nations, is now moving to exploit its leverage to favour domestic industries. New tariffs have been introduced and trade agreements are being renegotiated on less liberal terms. What was for two generations a question only of whether international trade grew slower or faster now must include the prospect that regulation may force it backwards. Trade wars may be easy to initiate but winning is improbable, unless the benchmark is solely crude politics. Employment and living standards should form part of the calculation. The Productivity Commission published estimates in 2017 of the damage that such initiatives impose on both the initiator and the rest of the world. These costs are serious. An open trade policy has contributed clearly to making our economy resilient to shocks over more than 25 years of uninterrupted growth. Australia’s recent policy steps have been inconsistent and in many cases heading in the wrong direction. New project finance vehicles have been established that have the potential to skew industry assistance to particular firms and projects with minimal public scrutiny until deals are done. Major shifts in tax have favoured a particular cohort of businesses. Bilateral trade agreements continue to be negotiated without publishing sound prior analysis to show where net benefit to Australia is being sought or to allow the Parliament to see if these objectives have been met. Opaque processes rarely make good policy. 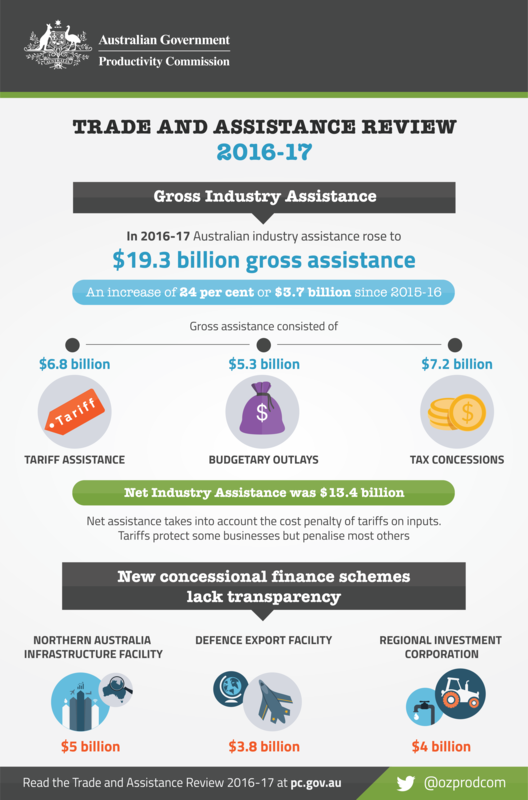 The Commission estimates that gross assistance to industry provided by the Australian Government was $19.3 billion and that net assistance (after deducting the cost penalty of tariffs) was $13.4 billion in 2016-17. This was a substantial increase on last year’s estimate of $9.7 billion in net assistance. These estimates are conservative as they exclude harder-to-quantify assistance: favourable finance (loans, debt, equity, guarantees); local purchasing preferences, such as for defence equipment; and regulatory restrictions on competition. Global trade policy appears to be at a dangerous cross-roads says the Productivity Commission in its latest Trade and Assistance Review. As indicated in the report, the USA, having long led the drive to liberal world trade with positive effects for growth, is now moving to exploit its leverage to favour domestic industries. 'Even if protectionism unfolds in fits and starts as it is at present, once it takes hold in popular opinion it will prove very hard to wind back,' Productivity Commission Chair Peter Harris said. 'Australia’s interests clearly lie in resisting this protectionist trend. An open trade policy has contributed to Australia’s economic resilience to shocks over more than 25 years of uninterrupted growth. However, major political parties have in recent times taken confusing and inconsistent positions,' Harris said. Australian industry received more than $19 billion in assistance from the Australian Government in 2016-17, a substantial increase on last year’s estimate. Tariffs made up $6.8 billion of this figure; budgetary assistance $5.3 billion; and tax concessions $7.2 billion. The bulk of industry assistance still favours manufacturing over other export industries. The Commission’s figures for industry assistance are conservative as they don’t include the significant assistance provided by government through favourable finance, local purchasing preferences, and regulatory restrictions on competition. ceasing to view the anti-dumping regime as a cheap card to play every time an industry claims to be threatened by imports. 1.3	Rising protectionism: how should Australia respond? In 2016-17 Australian industry assistance rose to $19.3 billion gross assistance. An increase of 24 per cent or 3.7 billion since 2015-16. Net industry assistance was $13.4 billion. Net assistance takes into account the cost penalty of tariffs on inputs. Tariffs protect some businesses but penalise most others. Regional Investment Corporation: $4 billion. The following excel files contain tables of data used to make the charts within the Trade and Assistance Review 2016-17 . There is also an extra file with data of Australian Government budgetary assistance by program.